Who doesn't love the feeling of soft covers? I guess like father, like daughter, as the hubby does not buy bed sheets that do not pass the "stroke test" while the girl is super picky on the kind of blanket she uses. She would literally kick off her blanket again and again if it isn't soft enough for her taste! 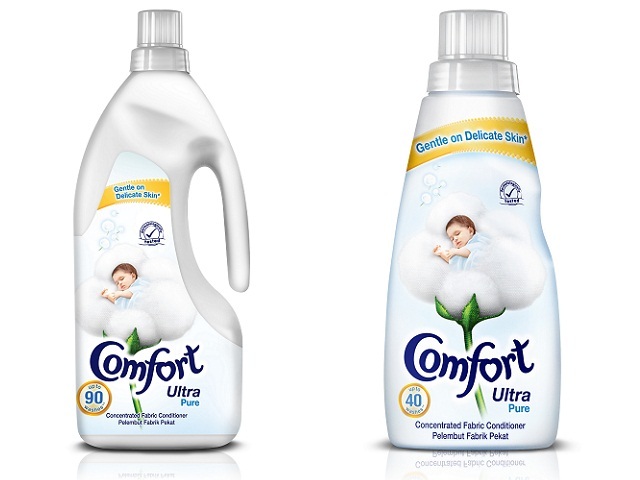 Some time ago, Comfort Ultra sent me their new range of fabric conditioners, Comfort Ultra Pure, to try out. Specially formulated for delicate skin, Comfort Ultra Pure ensures that your laundry ends up with pure softness and long lasting fragrance. The best thing is, Comfort Ultra Pure is dermatologically tested to be safe even for the delicate skin of a baby! That means no more washing of your baby clothes and blankets separately! You can now throw all of them into the washing machine together with the rest of your laundry and you will still get baby-soft clothes and covers suitable for children or adults with sensitive skin. We've been using the softener for a while now and let's just say, the girl has been tolerating her blanket a lot better (I say tolerate because she never liked blankets in the first place). Disclosure: This is a sponsored advertorial on behalf of Comfort Ultra Singapore. All opinions are my own.